If you are a photographer, it is not hard to figure out why I took this shot. 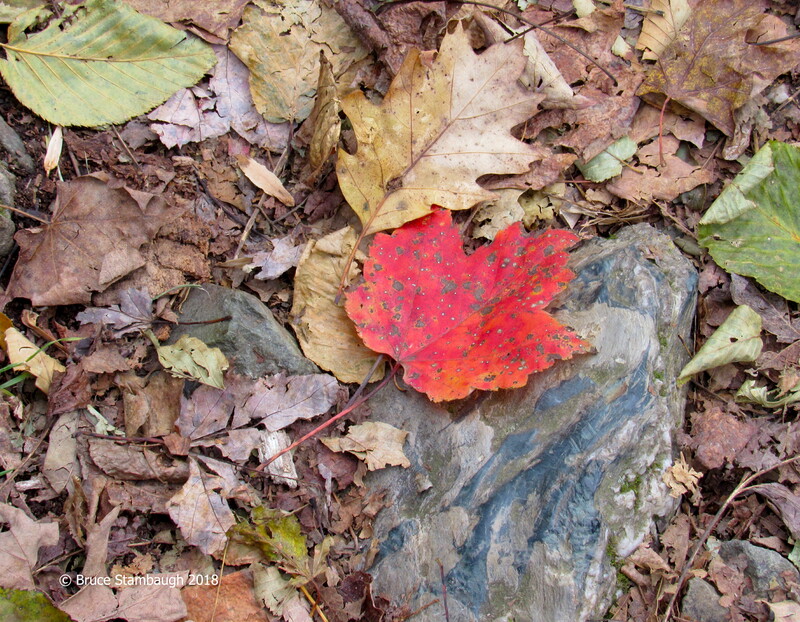 The bright red maple leaf lying in the middle of the Appalachian Trail jumped out at me. Amid the late fall drabness of mostly bare trees, frost-killed ground cover, and other fallen brown leaves, how could I not see the leaf resting upon the bluish-gray basalt rock? From my perspective, this composition was just waiting to be captured. “Where it fell” is my Photo of the Week. The view from Jefferson Rock of the confluence of the Shenandoah and Potomac rivers. There are times when a life experience far exceeds our expectations. I had just such an encounter recently on a junket my wife and I made to Harpers Ferry National Historic Park in extreme eastern West Virginia. This tiny, old town had played a small but important part in our country’s big history. On a precipice 800 feet above the confluence of the Potomac and Shenandoah rivers, more flowed together for me than two charming waterways. 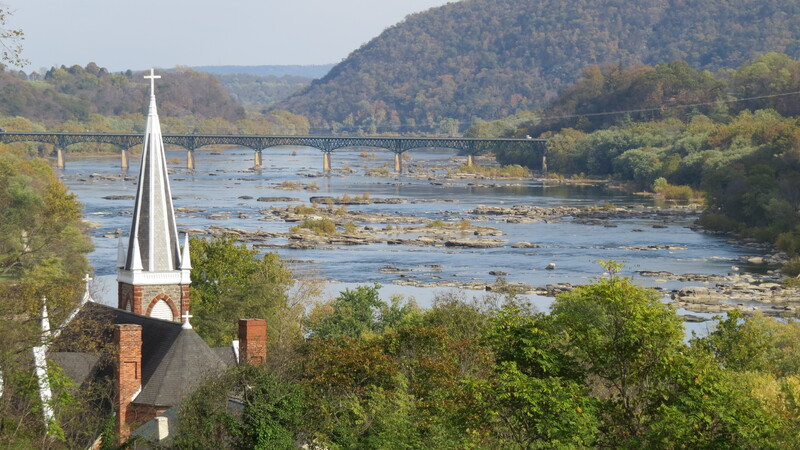 I had previously seen scenic shots of historic Harpers Ferry from this vantage point in Maryland, and had fancied a few of my own. I departed with more than picturesque photos. The beauty of the bright morning itself was stunning. I basked in the warmth of the morning sunshine looking down on history. The strengthening sun drenched the charming village in a golden wash. It was a map come alive where famous Americans had all made important imprints on our country’s checkered history. A Great Blue Heron preened in the morning light at the confluence of the Potomac and Shenandoah rivers. The three-mile hike from Harpers Ferry to the overlook was exhilarating. A hint of haze hung above the surface of the churning rivers on the cool morning. My goal was to arrive at the scenic overlook opposite the town as the day’s sun rose above the Appalachian foothills. I crossed the footbridge, a part of the Appalachian Trail, which paralleled the bridge of the railroad tracks. The tracks split at the town and followed the two majestic rivers, one south, the other west. Once across the Potomac, its melodious rapids singing all the while, the Appalachian Trail followed the river and the old C & O Canal east. I walked west along the towpath to the trailhead that led up the rocky, forested hillside. I couldn’t imagine how soldiers, Confederate and Union alike, had muscled heavy artillery up these steep slopes. Massive rock outcroppings protruded everywhere beneath the hardwood forest. The rich greens of mountain laurel and cedars complemented the coloring leaves of the mixed deciduous trees. The Potomac sparkled as it sang. As I sat on the cool rocks I looked down on the spot where John Brown had made his ill-fated raid in 1859. I envisioned Jefferson, George Washington, Robert E. Lee, Thomas “Stonewall” Jackson and all the others who had made their lasting marks there striding along the slanting, narrow streets. 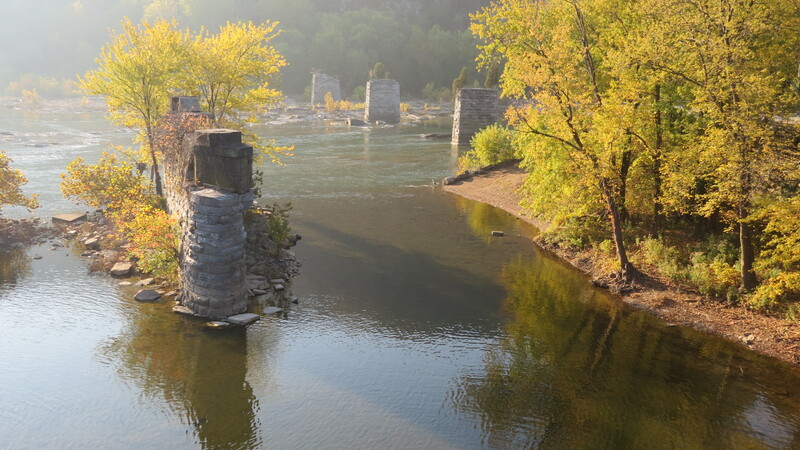 Harpers Ferry was a strategic town in the Civil War since it housed the federal arsenal. Both armies occupied the town intermittently during the war. It was the sight of the largest surrender of United States troops in the Civil War. Behind me birds of the forest searched for breakfast amid golden, backlit leaves. Carolina Wrens, chickadees, cardinals, robins, Tufted Titmice, White-breasted Nuthatches and Brown Creepers scavenged the forest floor and trees. A Black Vulture sailed west above the Potomac just off of the cliff. A Red-shouldered Hawk, its black and white striped tail fanned out, glided east. Beneath me a freight train rumbled through the tunnel, across the bridge and whistled past the old station. I had gone up to the sheer cliff for some pictures. I came down with a renewed spirit of gratitude for all that has transpired and will transpire in my life, in our lives. Together we have a lot for which to be grateful this Thanksgiving. 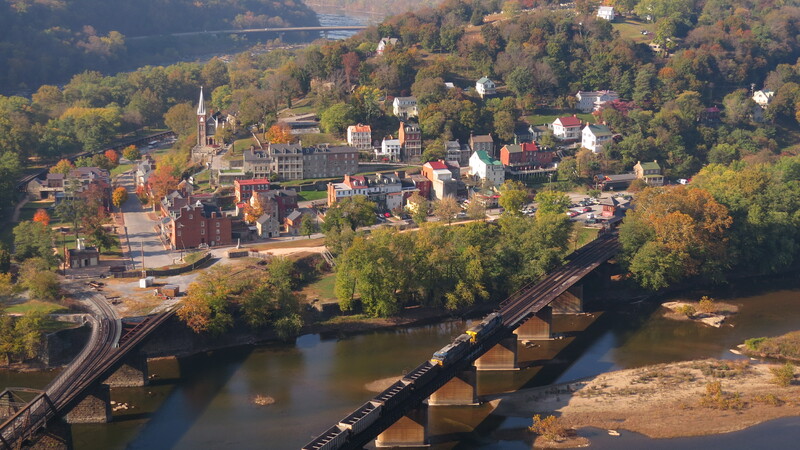 Harpers Ferry, WV from the Maryland Heights overlook.